Interview with Alpen Optics representatives - Interview with Anthony Proper and Tom Hallett (Alpen Optics) - AllBinos.com . Question: How the history of Alpen Optics binoculars has begun? When the first Alpen binoculars have appeared on the market and what parameters they had? Answer: Alpen Optics was established in December of 1996. President Tim Gardner was formerly a Vice President of Bausch & Lomb Bushnell Division and wanted to offer products with good quality at a better value than what was being offered by other companies. Our first products were introduced in 1997 and have since expanded to over 100 products from entry level to high end. Q: How big is your company? How many employees you have? A: Alpen Optics has 18 employees and has grown steadily over the past 14 years. Sales are under $15 million USD. Q: Which Alpen binoculars ever manufactured is the most interesting one for you and why? A: I like the Wings binocular family of binoculars with the ED glass because they really offer great optical performance at an affordable price. It was fun to design the open hinge body design and then combine ED optics to provide this great product to our customers. I also am fond of our Apex zoom roof prism binocular which is very unique. 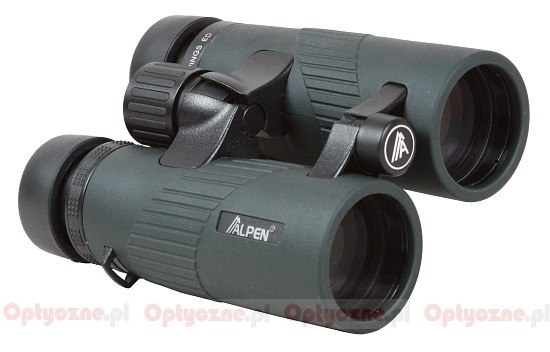 Alpen Optics Wings 10x42 ED binoculars. Q: Why there are so few Porro binoculars in the current offer of most important players on the market? It is strange because Porro prisms give the cheapest way of obtaining good quality optics. A: Porro prism binoculars in the USA have become the product of choice at the lower price point side of the market due to the continued popularity of the roof prism (or what I like to call European style) design. Porro prisms are easier to make and can provide great optical performance, but the market has moved more to roof prism design due to the more streamlined body design which most people seem to feel is less bulky and more convenient to carry. And in many cases it is more difficult to make porro prism binoculars waterproof with the center focus design. Many people like the waterproof features of roof prism binoculars and the overall feel of the design. Q: How many binoculars does Alpen sell each year? What fraction of global and US market is occupied by Alpen? 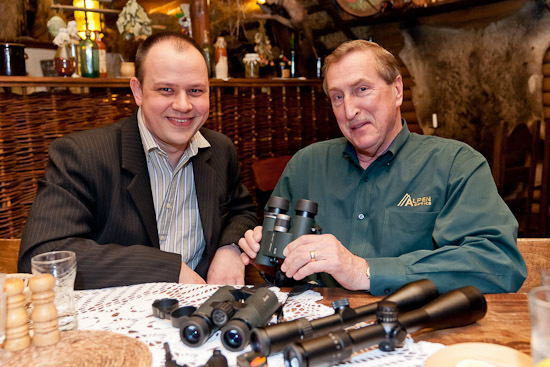 A: Alpen sells thousands of binoculars, spotting scopes, and gun scopes each year. It is difficult to know our precise market share, but recently NSFF foundation did a survey and noted that Alpen was #2 behind Bushnell in the US market. Q: What countries you are selling most binoculars to? Could you compare Poland with other countries? A: The majority of our sales is in North America, although we have grown steadily in the European market over the past 6 years. Poland is an important market for us and is still in the beginning stages of growth. Q: Which brands are most serious competitors of Alpen in US? A: Alpen competes well against the traditional known brands of Bushnell, and Nikon. We feel we offer better quality products at better pricing than these large corporations and we also feel our customer service and responsiveness is superior. Q: The biggest Alpen binoculars have objective lens of 50 mm diameter. What with bigger binoculars which might be interesting for astronomy amateurs, night hunters or for marine applications? A: When growing a business it is important to focus on markets that we can provide better products at better pricing. Alpen does not currently offer products specifically for astronomy or marine markets but we do offer many products that can be used for both purposes. At this time we are not moving specifically into the astronomy market but we are always looking at new opportunities in the marine market if potential sales volume will justify it. Q: In Europe the classic binoculars for hunters is 8x56. Are you going to introduce such an instrument? A: We are working with our European distributors to determine which products might be popular to offer in this market. We are currently reviewing several product designs to see if they will be appropriate for the European market. Q: You have introduced new Rainier HD ED binoculars, recently. Could you say something more about the differencies between new Rainiers HD ED and old ones? A: The new Rainier 42 mm HD ED binoculars use the same basic optical system as the previous top quality Rainier binoculars except we have included what we call HD ED elements to the optical design. This provides additional color fidelity and resolution while reducing chromatic aberrations. In addition the body design has been changed to an open hinge style reducing weight by several ounces and providing a more comfortable binocular to hold. The diopter adjustment has also been moved to the focus wheel and is adjusted by pulling the focus wheel up and then locking the adjustment by pushing the focus wheel back down. Objective lens dust covers are also designed to be attached to the body rubber and can be removed or replaced as desired. Q: Are you going to renew Rainier 32 mm models, too? Maybe introduce 50 mm class models in this line of binoculars? A: The 8x32 and 10x32 Rainier models are the same as before and do not currently offer ED optical design. At this time there are no plans to modify these models although we continue to study ways to improve to help meet customer expectations. Regarding the 50mm style, we are also studying this although it would require a separate body mold and new optical design. The cost is quite high to accomplish this and the market demand for 50mm and larger is rather limited at this time. Q: Rangefinders in binoculars, balistic calculators in spotting scopes, Zeiss Photoscope - there are more and more products joining optics with electronics. Does the future belong to this type of instruments? Binocular with digital camera, for example? A: It is possible that more electronic / optical products will be offered on the market. But the challenge is to produce them at a price that more people can afford. Zeiss products are very good quality and are world famous….but most people have difficulty affording them. At Alpen we try to develop products that offer utility and quality at an affordable price. We continue to study opportunities to bring electro/optical products to market and hopefully in the future we will be able to offer something that meets the consumers desires. Q: Are the binoculars and spotting scopes designed by you, or are you cooperating with some external research institutes or technology centers? A: We work closely with our manufacturing people to develop unique optic products as much as possible. We try to develop unique features and cosmetic designs while also working to provide better optical performance at lower price points. Q: Does Alpen have team of people working on new types of glass? A: As mentioned above, Alpen works closely with the manufacturing and engineering people to stay abreast of new technological developments in glass as well as other technical developments. Q: Do you make a glass used for binocuars and spotting scopes on your own, or you just buy it from an external supplier? A: I am not an expert about how all current consumer optical companies obtain their glass, but it is my belief virtually no company makes the glass used for its consumer sports optical products. Glass making is very capital intensive and there are several large glass manufacturers in the world that supply the majority of all glass used in consumer sports optics today. Alpen uses glass from several manufacturers depending on the grade of glass, availability and cost. Q: What is the current direction of progress in sport optics? Is it connected mainly with work on better antireflection coatings or maybe on new types of glass or even both? A: All aspects of consumer sports optical products are being expanded. Weight reduction, improvement in light transmission, improvement in general optical performance, and mechanical design are always being challenged. An expansion of ED products will continue as will better coating technology and as mentioned above electro/optical products. Q: May we expect new image stabilized Alpen binoculars in near future? A: Image stabilizing binoculars are of interest to Alpen but we currently do not have a product on the immediate horizon. Q: Buying the expensive photographic lenses we often get the full information about the lens, including the MTF and chromatic aberration graphs, vignetting and distortion data. 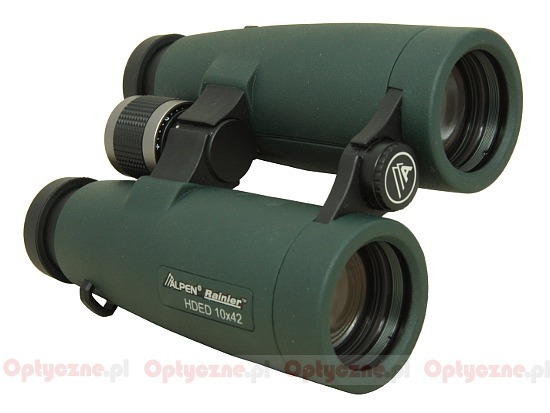 Why, buying the Alpen binoculars, we do not get similar information? It would be nice to get the transmission graph, for example. A: It is our experience that most people are not as interested in finite technical information as they are with finding a great product at an affordable price that they can use for their general outdoor use. Photographers and astronomers tend to be more interested in obtaining more technical information as they are using products under more specific and narrow uses. We are trying to be focused on the general outdoor user be it a hunter, hiker, or birder and while providing detailed technical information might be of some use, it is not something we see as a large need by our customers. We like to have our products tested against other brands at similar or greater price points and let the testers evaluate the results. Alpen products consistently rate very high against other brands at similar or higher price points. 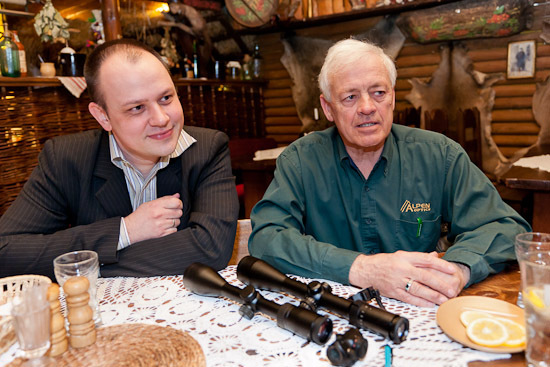 Q: You have a lot of binoculars, rifle scopes and some spotting scopes to offer. What about the astronomical telescopes and eyepieces? A: We are not currently in the astronomical market at this time as it is dominated by many other brands and a multitude of products. We feel it is better to concentrate on the sports optical market and to do a great job in this effort rather than become too fragmented chasing too many markets. Q: There are zoom eyepieces and two fixed focal length eyepieces for Alpen Optics spotting scopes. Are you going to introduce a new short focal length eyepiece giving high magnification? A: The markets we sell to and the majority of our customers do not seem to require interchangeable eye pieces. Most people who use spotting scopes prefer a zoom eye piece due to it’s obvious flexibility to provide lower magnification with a wider field of view and the convenience of zooming to a higher magnification for the closest view. Fixed eye pieces are a very small part of what customers seem to require based on our sale experience. Q: Thank you for the meeting and interview.